Nick Press and Andrew ‘Noddy’ Hay (Sydney Sailmakers) have capped off an extraordinary season after successfully defending the 12ft skiff Australian Championship title they won last year when The Kitchen Maker 12ft Sailing Skiff Australian Championship was sailed over Easter. Press and Hay who have sailed only the past two seasons together, have won every major 12ft skiff event this season, including the Upper Harbour, Parramatta River, NSW and Port Jackson Championships, along with the Interdominion, sailed between Australia and New Zealand each year. Press, from Gladesville, and Hay, from Kirribilli won four of the six races sailed on Sydney Harbour between Goat and Cockatoo Islands to have their names carved on the Norman Booth Trophy again. Long-time rivals and Race 5 winners, Brett Hobson and Bill Lusty from the Sydney Flying Squadron at Kirribilli, finished runners-up, six points in arrears. Third placegetters and top Veteran crew were Race 1 winners, Jono Temple and Richard Jones (LCC Asia Pacific) who have sailed together for 24 years. Press, who lost his voice due to the flu, left Hay to do the talking. “I’ve sailed with Nick for two seasons and we’ve just won back-to-back Australians,” he said, describing conditions as “mostly benign. “We all sailed with our big rigs throughout, as conditions were mainly light, around 8 knots, although we had a brief southerly change on Sunday, but it didn’t last. The wind got up in the high teens and we had a swim (capsized), because we were overpowered,” Hay said. The pair unusually won the Championship with ease, as Geotherm’s Hobson and Lusty were not in their usual red-hot form. “We did have one really close race with them when they beat us in Race 5, otherwise we were quite comfortable. Otherwise, we’ve had such a good battle with them all year, they normally push us hard,” commented Hay who is looking forward to sailing with Press, the dominant force in the class since 2004. Press comes from a long line of skiff sailors. His father Murray, crewed by Charlie Gundy (Bigfoot Custom Trapeze Harnesses) finished the Australian Championship in fourth place and second in the Veterans division. Hay made a switch from the 18 foot skiff class where he sailed with John Winning for many seasons. “For me to come into the class as a ‘newbie’ it’s very pleasing to have had such a successful season,” he said. “I’m really enjoying the class and our results – and the camaraderie in the class. It’s an incredible boat to sail. I’d love to see more young guys in it. It was good to see Jimmy Walsh and Michael Kennedy (Karoshi) make a comeback and to see the guys from Queensland come down,” Hay finished. Gael and James Glassock (Cunning Ham) won the Junior Crown, while John Mulquiney and Robbie Polec (Handful) took out the Handicap title for the Colin Clark Memorial Trophy. The 12ft skiff has traditionally been a stepping stone into the 16ft and 18ft classes. Some of Australia’s most famous sailing names have raced and won in the ‘12’s’ including Iain Murray, John ‘Woody’ Winning, Michael Coxon and Dave Porter. From across the paddock, Bruce Farr, John Chapple, Russell Bowler and Don Lidgard represent the best. 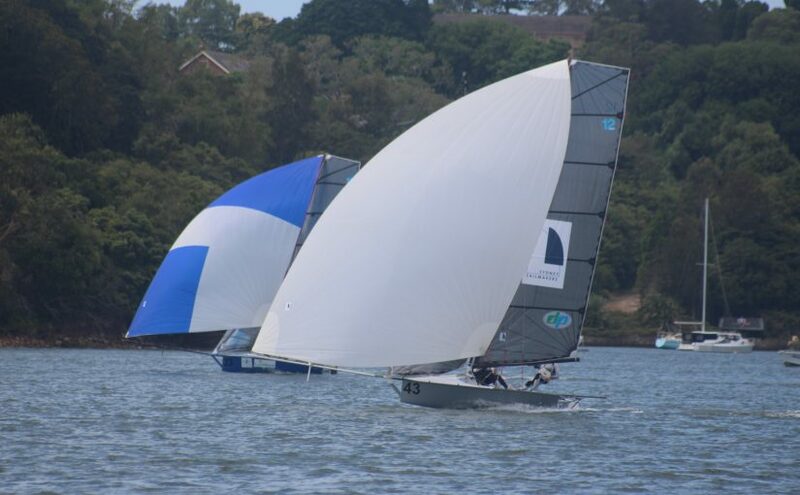 Twenty five skiffs representing NSW and Queensland took part in The Kitchen Maker 12ft Skiff Sailing Australian Championship, which completes the season for the class. This entry was posted in News on April 19, 2017 by Skiff-Ed.